The tradition of Noontime Concerts began in London during the Second World War. 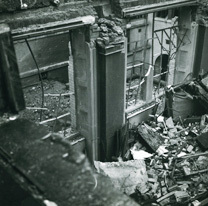 To avoid mass casualties during air raids, the British government had closed the galleries, museums, and theaters of London and the paintings in the National Gallery were moved to safe storage. This citywide cultural blackout had a demoralizing effect. But the legendary British pianist Dame Myra Hess had the idea of temporarily converting the Gallery into a concert space where daily music programs could be staged. 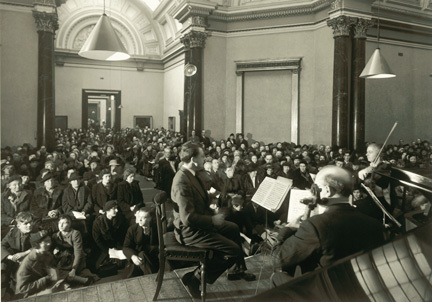 The concerts were free and became wildly popular, and were renowned for drawing audiences from all walks of London society, from lifelong devotees to the many who had never heard classical music before. The series began during the Blitz, and over the next six years, there were around 1700 concerts in all. Of course, there were always challenges: At times during the air raids, they had to relocate the concerts into a cramped basement, where the performers themselves often had to wear winter coats. A clarinetist once had to heat her instrument on a stove, and most infamously, a bomb exploded just rooms away during a Beethoven quartet. But the musicians played on–according to accounts when the bomb exploded they literally did not miss a beat. And so too did the wartime concert series continue without missing a day. Every afternoon, Monday through Friday, the bombarded people of London gathered together to unite among the shared beauty of classical music. We at Noontime believe there is still the same need for communion with beauty. We hope to enrich the cultural life of San Francisco by providing a weekly refuge for the live experience of classical music. We are proud to be associated with the traditions and missions of the original Dame Myra Hess concerts. In England, the contemporary London version of Noontime Concerts takes place in the Royal Parish Church of St. Martin-in-the-Fields, which enjoys one of the finest musical reputations in the world. Concerts take place on Mondays, Tuesdays, and Fridays at 1:00 p.m. Acclaimed musicians have an opportunity to perform at this central London venue for a discriminating audience. 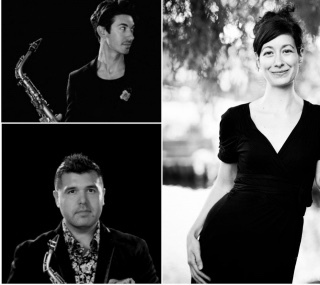 For more information about London’s historic midday concert series, please visit the St. Martin-in-the-Fields website. New York’s Concerts at One take place on Thursdays in Trinity Church on Wall Street at 1:00 p.m. When in New York, call (212) 602-0800 for concert information or learn more on the Concerts at One website. Chicago’s Dame Myra Hess Memorial Concerts take place every Wednesday at 12:15 at the Chicago Cultural Center in Preston Bradley Hall. View the Chicago series calendar.